IOU is a purpose built 36 ft. Sports Fisherman boat. She has full toilet facilities, a large sundeck, spacious cockpit with sun awning and plenty of seating both in the cockpit and up on the flybridge. IOU has been maintained to the very highest standard. Passengers are encouraged to participate by re-baiting the lines, steering the vessel and coming up to the bridge where the navigational instruments are explained to you. IOU is owned by Alan and Nicola Birkett and is captained and crewed by very experienced fishermen. 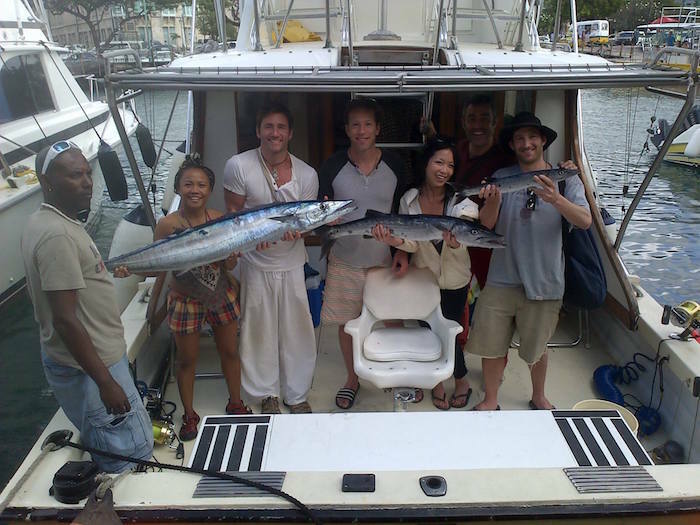 Alan has over thirty years experience fishing in Barbados and in other islands of the Caribbean. IOU offers 4, 6 and 8 hour charters. The 4 hour charters include drinks and snacks and the 6 and 8 hour charters include freshly made cutters, snacks, and a wide selection of drinks. All tackle and bait are supplied. The boat is equipped with full safety equipment and the latest electronics. Transportation to/from the boat is included. Private charter rates range from US$500 to US$1,000 for a maximum of 6 people. Shared 4 hour charters are also available on request.